A New Year means a new opportunity to give your medical office space the feel and look you really want it to have. With so much going on in a medical office, it’s no wonder that it can sometimes feel like there just isn’t enough room to handle it all. That being said, there are lots of simple ways that you can capitalize off of the space that you do have to make your office feel bigger, run smoother, and operate most effectively. Read on to learn the tricks that will make 2019 the best yet for your practice! Nothing contributes to more clutter in a medical office space than mounds and mounds of unnecessary paperwork. In this day and age, if your office hasn’t transitioned into a paperless environment, you are definitely more than a few steps behind the times. Eliminating paperwork may mean a greater need for digital storage space (which could incur a slight cost), but it also means a far greater increase in available space within your practice. Just think of how much more room you would have if you were able to get rid of all of those bulky filing cabinets! Going paperless will also help to reduce the traffic and congestion around your reception area check-in desk. 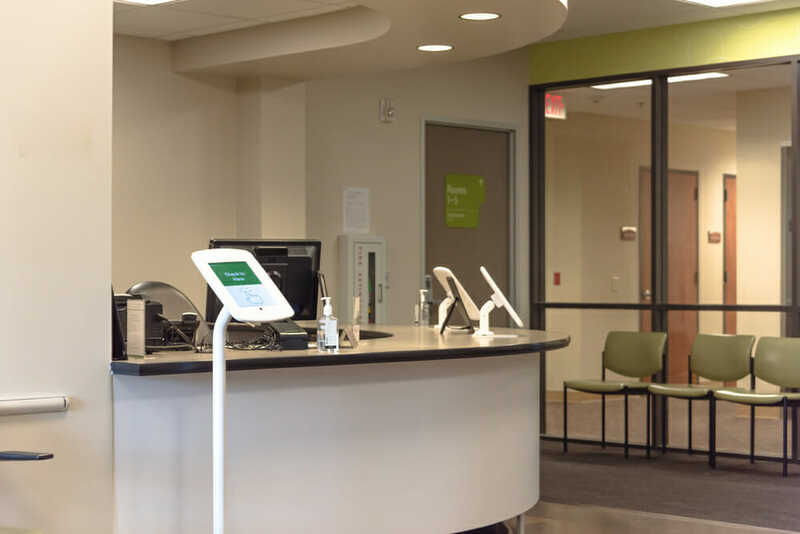 Strategically placing tablets throughout your waiting area will allow patients to complete the check-in process on their own, as well as fill out any necessary new patient paperwork digitally. Some offices may even go as far as allowing patients to schedule their own follow-up appointments. To keep the flow of your practice uninterrupted, consider making the work area of your medical office space the central focal point. Recreating your floorplan to include this very important detail will allow for better visibility from all staff, as they will be surrounded by exam rooms and able to keep a better eye on the patients. Also, keeping the work area centralized will lead to greater efficiency, as everything your staff may need will be extremely close at hand, no matter what task they are undertaking. The seating within the waiting area of your medical office space should be set up in a way that encourages interaction between patients, while also allowing for the level of privacy necessary to comply with HIPPA standards. Rather than making your waiting room one large, open space, consider breaking it into a few smaller seating areas. Doing so will help to alleviate some of the aggravation that some patients can begin to feel if wait time exceeds their initial expectations. Also, offer plenty for waiting patients to do! Provide a variety of magazines and books, a refreshment table offering coffee and water, and access to free Wi-Fi. Exam rooms can feel a bit claustrophobic, particularly when waiting times get pushed beyond the norm. Open up your space by mounting computer screens on the wall, finding creative ways to maximize storage space, and arranging furniture in a way that makes your medical office space feel more open and airy. One of the easiest ways to make your medical office space feel and appear larger is to slap on a fresh coat of paint. Painting is a relatively inexpensive way to dramatically transition your space from feeling confined to expansive. Dark wall colors can give a cave-like effect to your space, while lighter colors such as whites, pale blues and greens, and beiges will have the opposite effect. A few other simple changes that you can make to your medical office space to give the impression of a larger, more open space are changing the flooring, capitalizing on natural light, and using mirrors. When considering flooring, use one style throughout the space. Eliminate transitions from room to room, instead opting for a uniform feel by laying flooring that runs from the entrance all the way to the back of the building (all in the same direction). Keep windows clean and clutter-free to allow as much natural light as possible to flow into your space. Decorating with mirrors will trick the eye into believing that the space is much larger than it actually is. Looking for Medical Office Space in Tampa Bay or the Surrounding Areas? Now that you know the best and easiest ways to make the most out of your medical office space this year, it’s time to locate the space that’s right for your practice. John Milsaps is a leader in the Tampa Bay commercial real estate industry, specializing in matching his clients with the right office and medical office properties in the area. With over a decade of experience working directly in this niche, allowing him to guide you through the ins and outs of the local market will be the best choice you make all year. Take a look through his database of available properties today and reach out to get started!